Sussex Cricket’s Lead Fast Bowling Coach and Assistant Head Coach, Jon Lewis, has been appointed as the Head Coach of the ECB’s Young Lions programme. The role includes leading the England Under-19s team, as Lewis did on an interim basis at the recent ICC Under-19s World Cup in New Zealand. The 42-year-old joined the coaching staff at The 1st Central County Ground in late 2014 after finishing an illustrious playing career at Sussex. His success working with the club’s fast bowlers has ensured that Jon’s services have been in increasingly high demand. Over the course of this winter alone, he has performed coaching roles with the England Lions, Perth Scorchers and the England Under-19s. Jon will continue in his current role at Sussex until the start of the Specsavers County Championship campaign on Friday 13th April. Reflecting on his time at Sussex, Jon said: “I’m extremely grateful for the opportunities given to me by Sussex since I joined in 2013. Sussex will always have a special place in heart. “Since taking on the fast bowling coaching position in 2014, I am very proud of my achievements, from helping grow million-dollar cricketers in Archer and Mills, to developing a youth pathway so our young fast bowlers can see a way to become future Sussex and England cricketers. 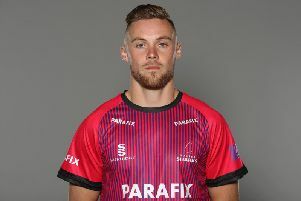 “These experiences aligned with the fantastic career development opportunities that Sussex and ECB have afforded me will put me in a great position as my coaching career progresses. Sussex’s Director of Cricket, Keith Greenfield added: “In the three years since finishing his playing days here at Hove, Jon has emerged as one of the game’s most respected coaches. “His work with our crop of young fast bowlers has been outstanding and it is no surprise that this was recognised by the ECB when it came to appointing someone to lead the country’s most promising young cricketers. “Alongside winning cricket matches, we’re very clear that developing players and coaches for England is a big part of what we’re trying to achieve at Sussex. “Jon’s new role and Carl Hopkinson’s appointment as England’s Lead Fielding Coach last week suggests we are successfully meeting that aim. “Jon’s are big shoes to fill, but we’re confident of finding a suitable replacement to work alongside Jason Gillespie and the rest of our coaching staff. Jon will become third former Sussex coach in a key role at the ECB, following Mark Robinson’s appointment as Head Coach of England Women in November 2015, and the recent appointment of Carl Hopkinson as Lead Fielding Coach. Sussex Cricket will be advertising for Jon’s replacement on the club website shortly.